Plans to go with Khufu-Khaf article which was returned to G.A.R December 5, 1932 (see W.S. Smith's letter to D.D.). Published: W.K. Simpson, The Mastabas of Kawab, Khafkhufu I and II, Giza Mastabas 3 (Boston, 1978), fig. 1. G 7151 mislabeled as G 7145. G 7145 appears twice. 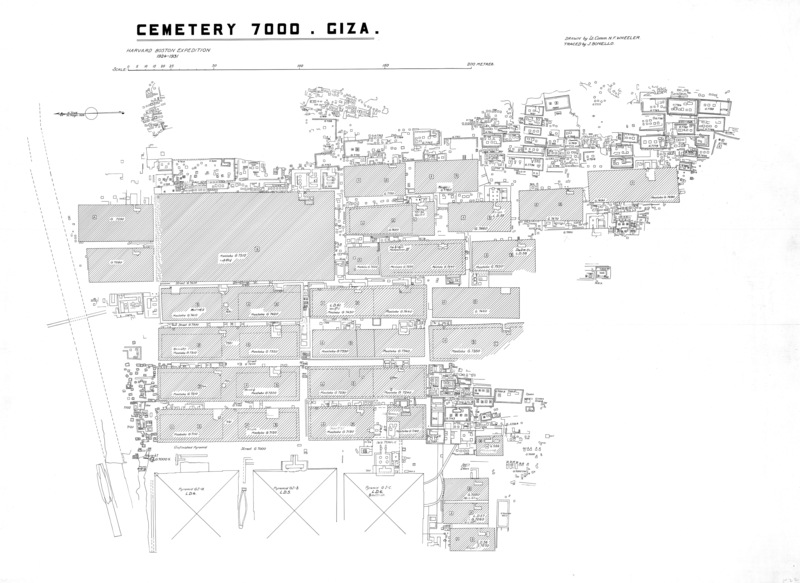 G 7012 A is shown N of Isis Temple P but not labeled. G 7013 A is shown S of Isis Temple under old rubble wall but not labeled. G 7333 mislabeled G 7232, E of actual G 7232.